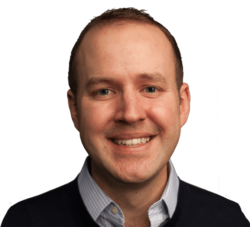 David Mihm has been a leading figure in the SEO world for years. Recently, he started a new firm called Tidings, that helps businesses achieve success in local markets. He's specialized in Local SEO and enlightens the readers of our blog with a series on this subject. This is the final post in an 8-part series on how to rank your business for local searches at Google. Previously, I’ve listed the most important aspects that influence your local ranking, discussed how to get the most out of Google My Business, covered best practices for on-site optimization. I’ve also given you some ideas for building inbound links and how to build citations, explained the importance of reviews, and the relative unimportance of social signals. Here, I’ll take a look at the most nebulous but potentially most influential component of local rankings: behavioral signals. As one of the most pervasive companies on the planet, Google has as much data about our behavior as any company in human history. They’ve been slower to use that data to inform local search rankings than many of us might have guessed, but recent company announcements and algorithmic updates suggest that may be changing. Experts in the Local Search Ranking Factors survey have pegged these signals at about 11%, but included in this 11% is the overall most important factor as well as several competitive difference-makers. 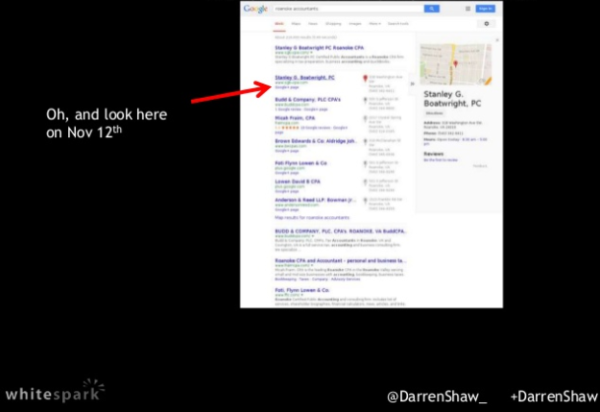 Only Google has a full picture of user behavior, so it’s the blackest of Google’s many algorithmic black boxes. Thus, many of the specific behavioral ranking signals I list below are either hypothetical or too new to have been tested by SEO practitioners. But Google’s longstanding mission in local search has been to reflect the real world as accurately as possible online. A reflection based on data from real-world human beings will be far more accurate than one based on data from digital-world webpages and robots. It stands to reason that as Google can gather more of this real-world behavioral data, it will grow in algorithmic importance for rankings. Let’s take a look at some of the behavioral data Google is likely using to inform local rankings, from most primitive to most advanced. Google has always been very good at detecting location on mobile phones (perhaps obviously). Now, they are scarily good even for desktop searches. And while it’s hard to describe something as sophisticated as detecting a user’s location as “primitive,” the algorithmic outcome of that location is relatively straightforward. 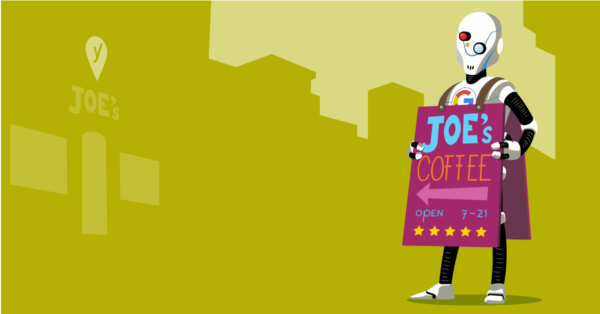 High-frequency brick-and-mortar businesses like coffee shops have a tighter radius of relevance. Low-frequency or service-area businesses like golf courses or roofing companies have a wider radius. If your business lies outside this relevancy radius from the search locations of large groups of your customers (for instance, a golf course west of Beaverton or east of Gresham in the screenshot above), you’re going to have a tough time attracting those customers via Google. 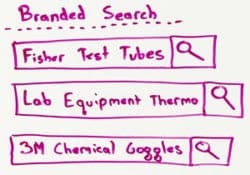 In a way, branded searches are a kind of citation: if corroborated by information in Google’s business database, they’re an expression of interest in that business (if not an out-and-out endorsement). While branded searches are an incredibly basic indicator of the awareness or popularity of a business, most Internet users perform these on a regular basis, making them one of the most democratic ranking signals. Beyond just the number of times a brand name is searched (and searched by people in a given geographic area), the context of those brand names is important as well. Adjacent keywords used in those searches that rank for future unbranded searches for those keywords. Generally, branded searches favor established businesses over new ones, and businesses that take a holistic approach to marketing (including offline). They’re one of Google’s best heuristics for word-of-mouth as it tries to build its reflection of the offline world. There’s an endless discussion around Click Through Rate (CTR) as a ranking factor in organic search. Evidence from two respected researchers Rand Fishkin and Darren Shaw, however, strongly suggests that it has at least a temporary impact on local results. Darren Shaw performed some longer-term studies later in 2014. He demonstrated that in some markets like personal injury law and accounting CTR had at least some effect on improving rankings. The theory is that the more people that click on your listing or website in a given search result, the more times it will show up for similar searches in the future. CTR is one step up from a branded search. CTR is an indication, if not endorsement, that the searcher thinks the destination listing or website will be relevant to her query. Google has never shared information about the inner workings of this ranking factor (and in fact has explicitly obfuscated its usage at all). 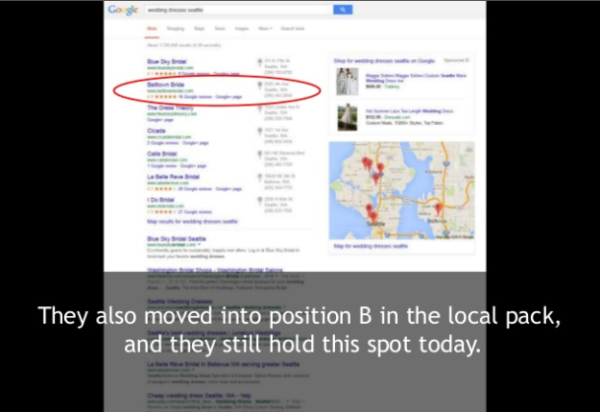 But SEO practitioners suspect there’s a mechanism involving CTR relative to position on page. After all, the top couple of results are always going to get the lion’s share of clicks. You can improve your organic CTR with more compelling Title Tags and Meta Descriptions on your webpages. 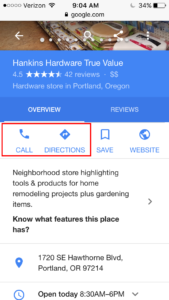 Your Google My Business listings have fewer options, but a superior review profile (both star rating and volume) will definitely help you stand out from the competition and earn more than your share of clicks. Since the introduction of Google+, the account infrastructure underlying Google’s products (Search, Gmail, Maps, YouTube, etc.) has been largely unified. As a result, we’re all perpetually logged in to the same account on every device. On some devices, like Android phones and Google Home, require users to log into their Google accounts before using them. While Google+ may have failed as a social network, as a tracking and data-gathering mechanism it’s been a smashing success. It’s now trivial for Google to track us from desktop to mobile to tablet, from Gmail to Maps to YouTube to Search and back again. Our behavior in each product and on each device informs what we see in different products on different devices. Websites you’ve visited (and engaged with) in the past are more likely to get a rankings bump in future searches for which that website is relevant. Knowing the location of your logged-in phone may inform desktop search results performed from the same account, as it’s a safe assumption for Google that our phones are always by our sides. Businesses and websites that have sent receipts to your Gmail account may rank better for future keywords in the same category. 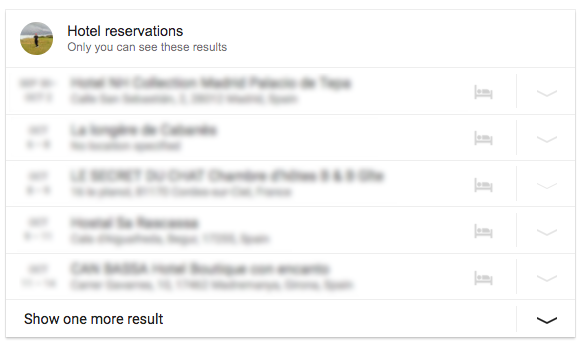 To see for yourself, search “hotel reservations” for a result similar to the screenshot below. From searcher to searcher, and keyword to keyword, every search result is increasingly personalized. At a practical level, this means that it’s increasingly difficult to track keyword rankings, as everyone sees a slightly different result. At a strategic level, it means you should do everything you can to engage your customers with reasons to return to your website, engage with your email newsletter, and share your business with their friends and family via email and text. Google is probably monitoring all of those visits and shares. It may use them to inform future search results for those customers, friends, and family, even if they don’t convert on their initial visit. As Google displays more and more Knowledge Panel results, the percentage of clickthroughs to webpages has dropped to under 50%. But that doesn’t mean searchers are no longer clicking at all: increasingly clicks are happening within Knowledge Panels. These Knowledge Panel click throughs are far stronger endorsements of a business’s relevance for a given query than a website visit. They’re a direct indication of a desire to transact with the business. Google has offered mobile click to call functionality since January 2010. Even as early as February 2014, 40% of searchers had used it. Where a phone call indicates a desire to learn more about a business, a request for driving directions is an even stronger indicator that a searcher intends to visit that business. It’s the strongest of all purely digital signals that a business is relevant for a particular query. Google has long offered users the ability to make bookings with hotels and restaurants directly from the Knowledge Panel through partnerships with Expedia, OpenTable, and others. 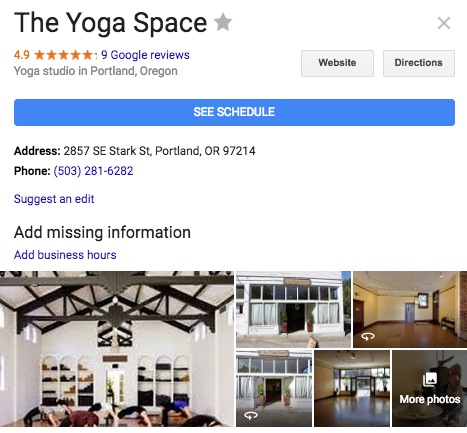 Jennifer Slegg recently reported Google expanded this feature to wellness and fitness categories through partnerships with booking services like MindBody. I expect we’ll see the pace of these partnerships pick up rapidly in other verticals. Businesses can now even “roll their own” booking buttons with the new Appointment URL feature. By offering this in-SERP interactivity with a business directly through Knowledge Panels, Google not only reduces the number of clicks to business websites but can collect more data about how searchers view a business. This data surely influences rankings, though as with most behavioral signals, only Google knows just how much. It’s a reasonable expectation that Google is tracking our on-SERP and click behavior online. But in the last couple of years, Google has moved from reasonable to downright creepy. Through its perpetual location-tracking of Android users and iOS users with the Google Maps app installed, it has a near-complete picture of our offline behavior as well. 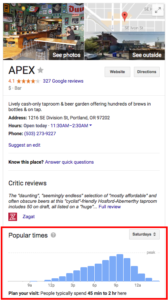 We see the outcome of this 360-degree tracking in the Popular Times section of many business’s Knowledge Panels, such as the one for Apex seen here. Google aggregates location data from any person it can–whether they’ve searched for a business or not–and puts that data front-and-center on that business’s Knowledge Panel. It even tracks how long people stay at a given business, and whether the businesses is busier or less busy than usual. This complete offline tracking helps Google offer its advertisers a “closed loop” of data as to whether online ads lead to offline visits. To think that Google isn’t using this same closed loop of data for its own local algorithm defies belief. But even for Google, there are privacy limits (at least for now). In 2015, it decided to scrap a feature that would have allowed advertisers to send push notifications based on a user’s location. Regardless of your feelings about whether knowing a business’s popularity before you visit is an acceptable tradeoff of your privacy, offline visits are surely the ranking signals which help Google identify local popularity and relevance most accurately — and they can’t be optimized. Google has surprisingly struggled to find success in the mobile payment space. Google Wallet was essentially a failure, and Android Pay has continued to lag even Samsung Pay in consumer adoption (both are far behind Apple Pay). Nonetheless, it’s hard to ignore data from 24 million consumers. Particularly in industries with frequent purchases like supermarkets, coffee shops, and gas stations, the volume of Android Pay transactions could well be seen as a reasonable indicator of the offline popularity of a business. But Google is not only looking at mobile payments — it’s now looking at all payments. Earlier in 2017, Google announced a partnership with credit card companies to track some 70% of all consumer purchases. In the United States, this partnership is already the subject of a federal privacy complaint. There seem to be few privacy advocates in any branch of government, though. Transaction volume will naturally favor big businesses with lots of customers, but historically Google has tended to favor smaller ones in its local search results. But I do expect this high-quality, highly-personalized signal to play at least some role in rankings moving forward. Many of the ranking factors above were not available to Google when it launched its local algorithm in 2008, or even as recently as 3-4 years ago. And it may be another 3-4 years before we start to see some of the more sophisticated ones influence rankings dramatically. But together I see them gaining more influence than any other piece of the ranking puzzle. Collectively most of these metrics, along with customer reviews, portend a much stronger and more sophisticated algorithm based on engagement. The more Google shifts its local algorithm in this direction, the less it has to rely on weak proxies of popularity like backlinks and citations, which are only implemented and controlled by an infinitesimal fraction of the population. You may be frustrated by the lack of tactical recommendations in this final installment of the series. The reality is, there’s very little you can do to game these signals. A local algorithm based on engagement benefits great businesses doing good marketing–a worthy outcome we should all support. Local search has become a multi-faceted paradox in the last couple of years. While the algorithm has evolved to reward more real-world behavior, the SERP interface is rewarding more technical tactics like Schema markup and rich snippets. And while the sophistication of Google’s algorithm and the number of local businesses who are paying attention to SEO make it harder than ever to rank, the payoff may be lower as fewer businesses win organic real estate above the fold. But Google isn’t going away anytime soon. Organic search results will continue to be an important customer acquisition channel far into the future. Regardless of how Google changes over time, the techniques I’ve laid out in this guide should help position your business effectively for whatever the next innovations are! Thanks to the Yoast team for the opportunity to share my suggestions experience with this community! If you want to keep up with my thoughts moving forward, you can subscribe to my newsletter. While you’re there, I hope you’ll check out my Tidings email newsletter product. I wish you all success with your businesses!